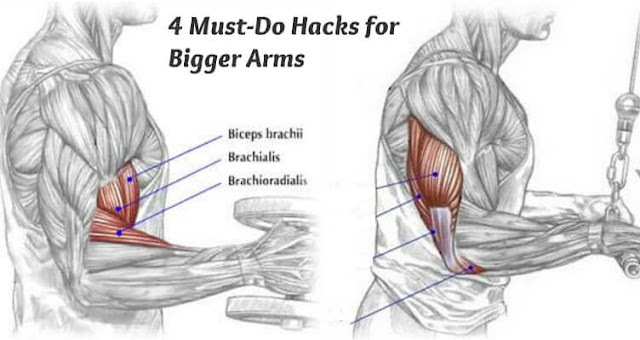 Home Workouts 4 Must-Do Hacks for Bigger Arms!!! 4 Must-Do Hacks for Bigger Arms!!! Bigger arms are one of the first body parts people notice on us, so it isn’t very surprising that having well-developed arms is the primary goal of many lifters. If you’ve spent countless hours training your guns at the gym but aren’t really satisfied with your progress, this only means that you haven’t found the approach which works best for you to get bigger arms. Gaining mass isn’t exactly rocket science and there are many ways to approach arm expansion, but constantly training in the same fashion leads to stagnation, so it’s probably time for you to try something new. Without making things more complicated than they have to be, here are 4 master tips for building monster arms! Blood flow restriction is a technique that works great for most people and it involves wrapping a restrictive implement around the limbs while lifting. When you restrict blood flow to a muscle, you can gain an incredible pump from the pooling blood and trick the body to use large fast-twitch muscle fibers, which leads to new growth. Studies show that combining low-load lifting and blood flow restriction significantly promotes muscle growth, so for this type of training you will be using 50% of your normal weight. This will not only increase the size of your arms, but it will be friendlier to your joints and let them recover from your regular heavy sessions. The best way to use blood flow restriction training is to perform it at the end of your heavy-load hypertrophy protocol. Take knee wraps and place them high up on the arms. Tighten the wraps enough so that it’s uncomfortable but not too painful, then try a high-volume superset of tricep rope press-downs and standing dumbbell curls using half of the weight you normally would. There are countless reliable studies which show that increasing training volume directly leads to muscle size gains, so this is not something that needs any further discussion. It’s really the simplest things that we tend to forget the most, such as the fact that muscles need to be targeted with the right intensity and volume in order to grow. If you’re training your arms once per week with a total of 5-10 sets, it’s clear that you need to increase your volume, to get bigger arms. Switch to training them three times per week, as this frequency has proven to work best for most lifters. However, instead of just jumping from one to three days of arm training per week, increase your volume gradually. Making big leaps can turn out to be too stressful for your ligaments and joints and cause painful injury. Arm training is all about placing high amounts of stress on the biceps and triceps and trying to break down as many muscle fibers as you can. To do this, you need to incorporate a full range of motion and drive the maximum amount of force into the target muscle, but also use exercises which employ different angles and thus cause maximum hypertrophy. The bicep is responsible for lifting the forearm toward the shoulders and rotating the wrist, and it consists of two heads: the long head which forms the outer portion of the muscle, and the short head which makes up the inner part of the bicep. The triceps, on the other hand, consists of three heads: the long head, the medial head and the lateral head. To target all heads in an effective way, you need a varied routine that will make almost every inch of your arm burn like hell after you’ve dropped the last weight. If you haven’t used supersets in your training yet, this might be exactly the improvement you need in order to accelerate your progress. Supersets are a super effective way to increase the intensity of a workout by overloading your muscles while reducing the total duration of the workout. They can be performed in several different ways, but the basics are simple: you do one exercise, then without any rest, immediately move to the second one. Reducing the rest interval between two exercises obviously increases the intensity and efficiency of the workout and enables you to do more work in less time – it really is an ideal combination. Regardless of whether you are a beginner or an experienced lifter, adding supersets to your routine will help you make gains at a faster pace and prevent training plateaus, so choose the type that would best train your weaknesses to build bigger arms. So in order to take your physique to the next level, you need to cycle through different rep ranges throughout your training sessions. This will allow you to break many different muscle fibers as possible and force your muscles to grow like never before. Training monotony is what generally causes muscle building progress to hit a wall, so whenever you feel like you’re losing steam, know that it’s time to start thinking outside of the box. Apply these 4 tips and watch your muscles grow!